Birgitta Järnåker is a warm, open woman, now 44 years of age. 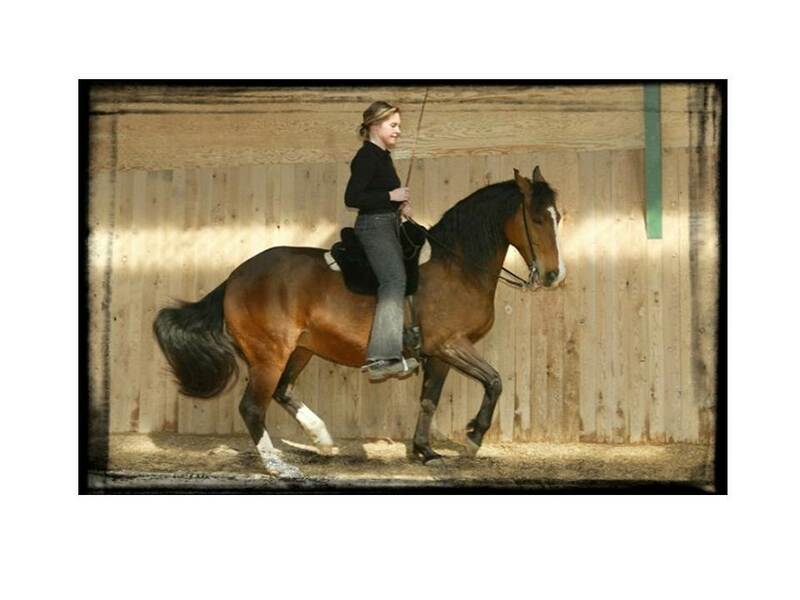 She has been a riding instructor for the last 27 years, always teaching a bit differently than the traditional instructor, due to her background in the Martial Arts and its philosophy. She has also worked in England, Germany with horses (in England at Waterstock, Lars Sederholm for a total of 1,5 year, also giving lessons there). She used to do showjumping and eventing on basic level and has ridden a bit of dressage too. Birgitta has been a student of Bent Branderup for 10 years. She has the title "Knight of academic Art of Riding" , which means she has schooled her horse to a certain level in this system. (Being a knight does not include any weapon training or such things as most people might associate a knight with. The knights had a much higher level of riding than most people think , and it is this way of riding that is of formost interest here). She also is a student of Ewa Jälmbrant in Umeå ( www.classicalstyle.se ) and has been inspired by her the last 7 years. She has done taichi and qigong for about 10 years, and has a black belt in the Martial Art, Hsing-I. Her training in this also included fighting arts, but also healing arts, such as acupressure massage, healing, meditation, tuina. Her teacher in this was/is the great master Sifu James Mc Neil. She has also been taught the healing form of reiki. (II) She has trained explosive self defence and taichi, qigong, with Slavo Gozdik in Sweden and taichi with Stewart Le Marseny from Australia. She has trained ashtanga yoga now for about 11 years, and has teachers both in Sweden (Maria Boox) and Denmark and now with Virginia Shermer in Gnesta. Johnny Remmerdal-Jörgensen is a generous, humorous man, 40 years young. He has a considerable background in different Martial Arts, such as taichi, tai-boxing, escrima, stickfighting, qigong, Hsing-I, splashing hands, Explosive Self Defence, etc. His teachers were in ESD Slavo Gozdik and in Hsing-I and splashing hands Sifu James Mc Neil. Taichi he has been taught by Claes Tarras-Walberg, Stewart Le Marseny and Slavo Gozdik. He has studied yoga for 5 years and is also training (he calls it "playing" himself) with fencing the last years (mostly sabre). Lately he has joined the European Historical Combat Guild in the city of Helsingör, which he finds very interesting. Johnny also works with massage and healing Arts, he is a Reiki Master (a form of healing with the hands) and is trained to be a chakra massage therapeut. He has started some riding training and he loves animals, but his passion is for the Martial and Healing Arts. And lately especially for the Historical Fencing. He is a brilliant teacher who has great knowledge of many things, and has a soft yet energetic way of sharing his skills.